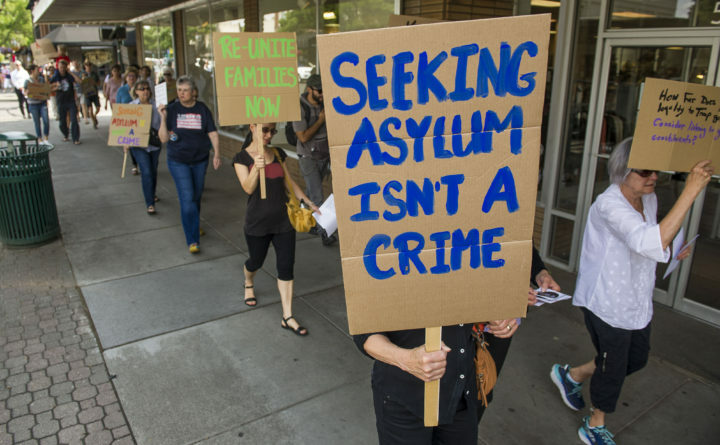 Protesters make their way down Main Street to U.S. Rep. Cathy McMorris Rodgers' office to bring attention to the U.S. asylum policy in Walla Walla, Washington, June 21, 2018. Much attention has recently been focused on the Trump administration’s practice of separating children from their parents at the southern U.S. border. The policy, which President Donald Trump ended with an an executive order and replaced with a policy of detaining entire families, was meant to deter immigrants from Central and Southern America from coming to the United States. It is only one of many ways the administration is trying to reduce not only new immigration, but also the population of immigrants already living and working in the United States. Asylum seekers, who are protected by the U.S. Constitution, have been a particular target for harsh policy changes aimed at shrinking their numbers. Attorney General Jeff Sessions last month ruled that escaping gang violence and domestic violence would no longer be considered grounds for seeking asylum in the United States. Sessions reversed an immigration appeals court ruling that had granted asylum to a woman from El Salvador who said she had been emotionally, physically and sexually abused by her husband. Immigration courts are part of the Department of Justice, not the judicial system, so Sessions can override their decisions. This is not how the asylum system is supposed to work, Dree Collopy, a partner at Benach Collopy LLP who is chair of the American Immigration Lawyers Association’s National Asylum and Refugee Liaison Committee, told Forbes last month. “He disregarded the principle that every asylum case must be carefully considered on its own individual merit and directed adjudicators nationwide to do the same,” Collopy said in an interview. In effect, Sessions is “inappropriately pre-judging asylum seekers’ claims as not warranting protection” without regard to the facts and evidence presented. “Sessions’ unilateral decision will undoubtedly result in significant numbers of bona fide refugees being returned to the hands of their persecutors,” Collopy said. Not content to try to keep asylum seekers out of the U.S., Sessions seeks to punish them if they make it here. Earlier this month, he rescinded an Obama-era policy that gave asylum seekers the right to work in the United States. Those seeking asylum are barred from applying for a work permit for five months. Asylum cases can take years to be decided, so working after the initial five months is vital. Asylum seekers are eligible for some government support programs, but politicians, like Gov. Paul LePage, have sought to restrict such access. Taking away the ability to work and restricting financial assistance dooms asylum seekers to poverty. Or, as the administration clearly hopes, it discourages them from coming to the United States. This is counterproductive at a time when employers are struggling to find workers to fill jobs. Sen. Angus King has pushed federal legislation to reduce the work permit waiting period to 30 days. This makes sense. Closing the door to immigrants seeking to avoid persecution, torture or worse in their home countries does not.